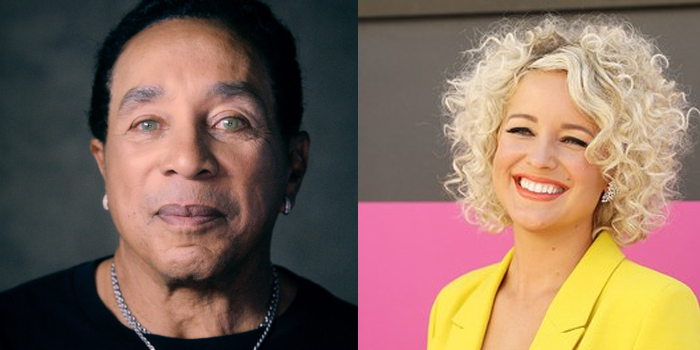 Motown icon Smokey Robinson and acclaimed country artist Cam will share the stage and swap vocals on their most beloved hits spanning multiple genres and decades in a new installment of CMT Crossroads, premiering Wednesday, March 28th at 10 pm ET/PT on CMT. Robinson’s musical contributions and influence spans five decades and 4,000 songs. A multi-talented artist and business man, the Detroit native climbed to world renown and dominated R&B charts as the lead singer of The Miracles with hits including “Shop Around,” “You’ve Really Got a Hold On Me” and “The Tears of a Clown.” He penned some of the most influential hits in American music including “My Girl,” and experienced massive success both as a solo artist and as Motown record producer and executive. Among his many accolades, Robinson was named a GRAMMY Living Legend and received NARAS’ Lifetime Achievement for his impact in music. California-born singer/songwriter Cam emerged as one of the true breakthrough artists of the past two years. Her international hit, “Burning House,” garnered Cam her first Platinum record, No. 1 country single and earned multiple award nominations including GRAMMY Award nomination for Best Country Solo Performance. “Burning House” is still the most-downloaded song by a female country artist since its release in 2015 and is off Cam’s debut album Untamed, which debuted at No. 2 on Billboard’s Top Country Albums chart with the year’s best first-week album sales by a debut country artist. Cam’s list of achievements is long, having shared the stage with superstars like Harry Styles, George Strait, Tim McGraw and Faith Hill. She also co-wrote Sam Smith’s latest release, “Palace.” Cam’s bold new single, “Diane,” the lead song off her forthcoming Arista Nashville/RCA Records sophomore album, has already received praise from critics and held a multi-week residency on Spotify’s Viral 50 USA Chart. CMT Crossroads debuted January 13, 2002 with Elvis Costello and Lucinda Williams and since has showcased dream musical partnerships including Kid Rock and Hank Williams, Jr.; Ray Charles and Travis Tritt; Dave Matthews and Emmylou Harris; Bon Jovi and Sugarland; Kelly Clarkson and Reba McEntire; Def Leppard and Taylor Swift; Sting and Vince Gill; John Mayer and Keith Urban; Steven Tyler and Carrie Underwood; Stevie Nicks and Lady Antebellum; Katy Perry and Kacey Musgraves; and Alicia Keys and Maren Morris to name a few.